Driving through Cannock Chase, a lovely area of heath and woodland in Staffordshire, I was surprised to see a sign pointing to the Katyn Memorial. 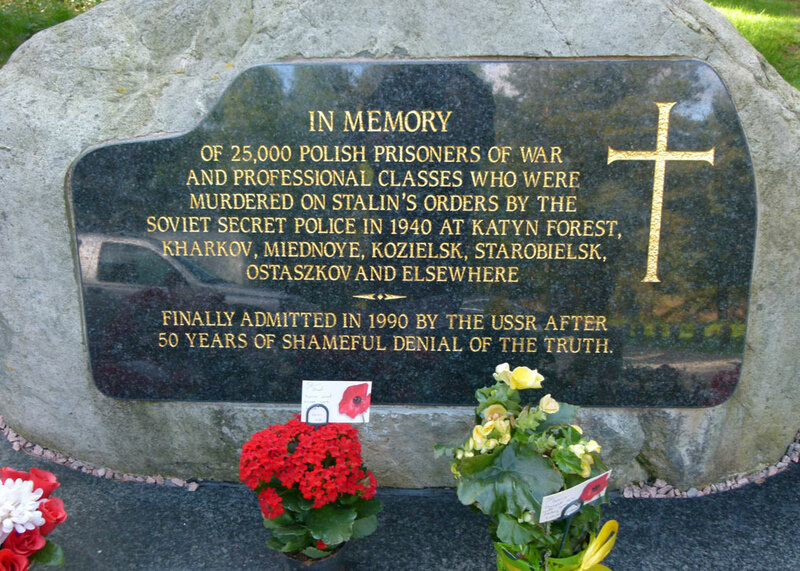 Katyn Forest is about 1600 miles away, near Smolensk, in Russia. There, in 1940, more than 4,500 Polish nationals were murdered by the NKVD, the Soviet Union’s sinister security police which later morphed into the KGB. The men, scores of whom had their hands bound, were shot in the back of the head and buried neatly in mass graves. In 1943, the Nazis found the bodies – many of which had identity papers on them – and promptly accused the USSR of mass murder. The Soviet Union, in turn, blamed the Germans. Fifty years after the event, in 1990, in the spirit of glasnost, or ‘transparency’, the last leader of the Soviet Union, Mikhail Gorbachev finally admitted that the victims had been executed on the orders of Stalin and the Politburo. It also transpired that there were other mass graves of murdered Poles, at Kharkov in the Ukraine and at Miednoye in Russia. The total number of dead was in the region of 25,700. Those slaughtered included army officers, policemen, lawyers, businessmen, engineers, teachers, doctors, professors – and at least one of them was a woman. They had been taken captive when, in September 1939, Poland was simultaneously invaded by the Soviet Union from the east and by Nazi Germany from the west – in accordance with the agreement, the Nazi-Soviet Pact, reached between Hitler and Stalin the month before. The German invasion prompted Britain’s and France’s declarations of war on 3rd September 1939. The Polish PoWs were held in camps, prisons and at other locations in Russia and the Ukraine. Here were potential leaders of Poland who could easily be liquidated. Probably, it was concluded that they were unlikely ever to be ‘re-educated’ into the Soviet version of communist philosophy. They were ‘bourgeois’ and therefore they posed a threat. There was, in any event, little love between the USSR and Poland. By the time the bodies were found at Katyn, of course, the Soviet Union was an ally of Britain and the USA, and the common aim was defeat of the common enemy – Nazi Germany. The role of the Soviet Union was decisive in achieving this victory. In that context, and probably mindful of a difficult post-war settlement in which Soviet troops would occupy large parts of Europe, both the British and US governments did not want to risk antagonising Stalin. It was easier, and tactically wise, to publicly disbelieve Nazi propaganda. Indeed, knowledge of the Soviet Union’s guilt was suppressed at the time. Possibly even more controversially, after 1945 and with the Cold War in full swing, successive governments resisted requests to erect a memorial to the victims of Katyn, presumably because it was viewed as provocative. The first such memorial was eventually put up in Gunnersbury, West London, in 1976. 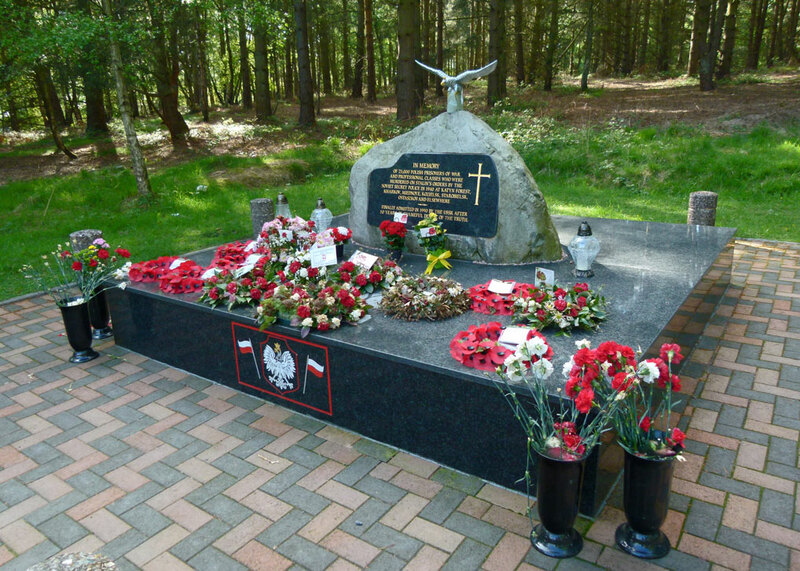 The memorial in Cannock, in a peaceful forest clearing, was erected by the Anglo-Polish Society in 1979. Its wooded location resonates with the site of the 1940 massacre. The stone is from Katyn and buried below it is soil taken from Warsaw and Katyn Forest. Until I saw the sign, I had no idea it was there. There are other Katyn memorials in Glasgow, Manchester, Southwell, New Jersey, Toronto, Baltimore, Budapest and, of course, in Poland. The Katyn War Cemetery, where I gather the mass graves still are, officially opened in 2010. 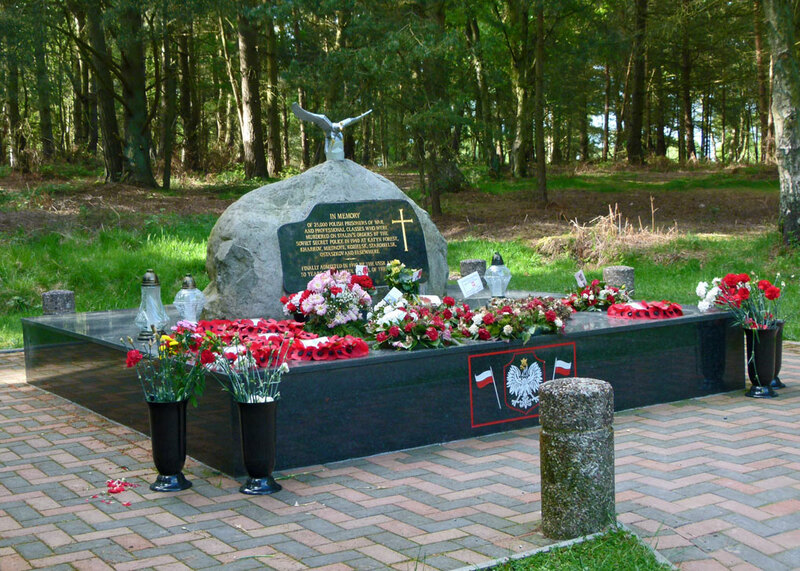 No nation has an unblemished past, and the perpetrators of this war crime are long gone, but the story behind the Katyn Memorial in Cannock Chase remains an inconvenient one for all except those commemorated – the innocent victims, and their relatives. We often go through that way but I have no knowledge of this at all. I’ll make a point of looking out for it. Thank you for this – I’m half Polish and had heard of the massacre. I didn’t know Baltimore and New Jersey also have memorials.